I returned to Orkney for one week in order to see the abattoir (slaughterhouse) there on Mainland. During this trip I also visited the Orcadian island of Westray (one of the most northerly islands of the group). CLICK on the arrows (left and right) if they are black - this means more thumbnails/photos. Click thumbnails to see the larger photo below. View of sea / cliffs. A view taken from the bus on the way to Kirkwall from Burwick. Also taken from the bus on the way from Burwick (South Ronaldsay) to Kirkwall. View from the bus; Mainland Orkney. View of the St. Magnus Cathedral (spire) from "Bishop's Palace", Kirkwall (Mainland, Orkney). Not uncommon around Scotland - they are seabirds. These particular birds were seen off the coast of Westray, Orkney. From the Castle of Burrian footpath/trail on the way to find puffins. Westray, Orkney. From southeast Westray, Orkney (Castle of Burrian trail). From the Castle of Burrian trail, southeast Westray (Orkney). One of two ruined buildings (palaces) in Kirkwall, just across the street from the St. Magnus Cathedral. It wasn't very exciting. Just another ruin. Interesting view of St. Magnus Cathedral from Earl's Palace. In his winter plumage (in May?!). I saw Eider ducks off the coast of Kirkwall and also off the coast of Westray. Have you ever heard of "Eider down" (i.e. in sleeping bags, comforters/duvets and pillows?). Gannets are huge seabirds related to pelicans and boobies (redfooted/bluefooted). Here is one in flight; photo taken from the Noup bird preserve in northwest Westray, Orkney. Highland Park distillery. It was nearly 12pm but the clouds made it look dark. Though it was a lovely day. This whisky distillery provided one of the best tours so far (it helped that there were only 2 tourists...me being one). Highland Park is one of only 5 distilleries left to malt their own barley. Here are the whisky stills of Highland Park. There are 4 (only 3 in the picture). You can't take photographs or have any electronics on around the whisky...it's explosive! So this was taken from outside the room with the tour guide there to tell me how far away to stand. Kirkwall, Mainland Orkney. A view from the Bishop's Palace on a lovely day. A lovely day yields lovely photos (IMO). A view of the town from in front of Highland Park whisky distillery. One of the big hills leading out of the town towards other parts of Mainland. On the island of Westray. I was all alone and even was allowed to enter (keys obtainable from the farmer across the street). It was spooky inside, all dark and quiet! Stone floors, dead birds etc. This is the only door and I entered through it. I ate lunch inside (OK, up on top where you could see daylight)! Noup Head is one of the big birding spots in Orkney, on the island of Westray. I am still amazed that I managed to make it up there with my hired bike. Beautiful light effect from the cliffs of Noup Head. One type of seabird that nests on the Noup cliffs, Westray (Orkney). I could have stayed there all day, except for the time constraints (and the slight fear of the cliff falling out from beneath me). I feel like a true birder now, travelling to all sorts of "exotic" destinations such as Westray, Orkney - mainly to see the birds! Gannets! I really got scared taking this photo...having to lay on my belly to try and get the camera slightly over the cliff edge to aim at the bottom of the adjacent cliff. Amazing! Truly amazing and wonderful. Most of the birds were guillemots ("aaks") and kittiwakes. The odd razorbill, fulmar and gannet could be seen if you looked hard enough. See? They're CLIFFS! Westray, Orkney. More birds and bird poop. :) Westray, Orkney. I walked this little path between the pools of Peerie Sea to get to and from the Pickaquoy Centre - the local gym/sports/entertainment centre. I went to see a movie. :) View facing northeast, towards the hostel. The bird species that I have ultimately wanted to see all through my stay in Scotland. "Supposedly" you can see them at a variety of places/islands in Scotland. But it's not easy to actually see them, even with specially planned trips. Here is the puffin island (Castle of Burrian) on the island of Westray, Orkney. You can see a puffin here. There was a good distance between the camera and the puffin...this was fully zoomed. (You can also see what a "lovely" <sarcasm> day it was!). This one flew really close to me -- about 20-30 feet away. I think this is really the closest you can get to a puffin! I was always afraid it would see me and fly back to the puffin island. He/she sat next to a fulmar. The puffin is quite a small bird. Similar to a penguin but with a more beautiful beak. I was just SO lucky and this really made my day (year?)! A rainbow that I saw from the ferry, which I took from John O'groats (mainland Scotland) to Orkney. It's not overly uncommon to see a full rainbow arch in Scotland. Another species of auk (related to the puffin). I saw these prior to seeing the puffins. This species tends to nest in hollows/caves rather than burrows (i.e. puffins). Westray. They have cute faces and great expressions. A shag, similar to a cormorant. Cormorants have a white patch over the throat/gnathothecal area, while shags do not. I saw lots of these on Westray. Picture taken from the tower of Bishop's Palace, Kirkwall. Amazing sunsets on nice days! From my room in Kirkwall. The sun set at 10pm. A photo taken while cycling to the Castle of Burrian trail, southeast Westray. 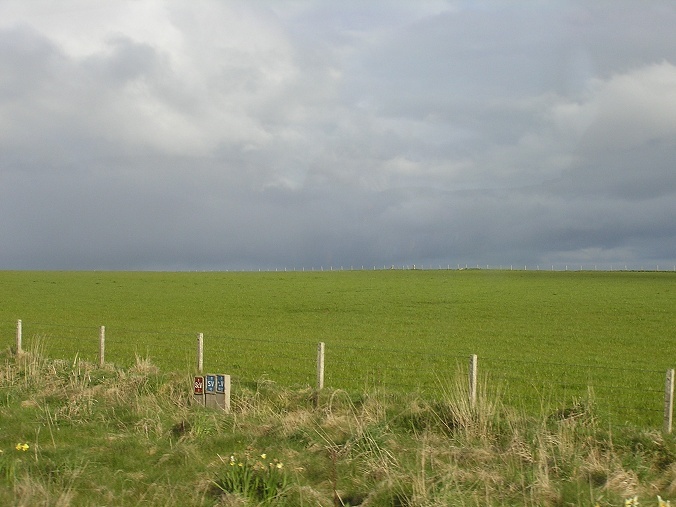 Another view of the Westray countryside. Cycling is such a great way to see the countryside, and talk to the cows (as I did)! A view taken on the way to Noup Head, in the north of Westray. I wasn't expecting this bird at all! Seen while looking for puffins and other seabirds on the Castle of Burrian trail. It looked like a dove from a distance (far away!). Then I thought it was a curlew (common here), until I looked in the bird book and saw that the head markings are distinctive.